From Westford to Milton to Natick, the treacherous winds Monday caused damage all over Massachusets. In Natick, a large piece of metal was dangling for hours off of St. Patrick's Church until it finally fell off. Powerful winds have knocked out power for tens of thousands of people across southern New England. The National Weather Service wind gusts over 60 miles per hour were reported in parts of Massachusetts on Monday afternoon. Meteorologists say damaging winds are expected to last through at least sunset in Massachusetts as well as Rhode Island and Connecticut. More than 46,300 Massachusetts customers were in the dark as of Monday night, while more than 82,850 New Hampshire customers were without power. Eversource reported more than 13,400 outages in Connecticut. National Grid said more than 4,040 customers were without power across Rhode Island Monday night. In Vermont, Green Mountain Power reported more than 1,180 outages. And more than 8,400 Maine customers were in the dark, as well. Police across southern New England reported downed trees and power lines blocking streets. In Wells, Maine, police say a trucker blamed wind for causing his tractor-trailer loaded with bananas to swerve and overturn on the Maine Turnpike. 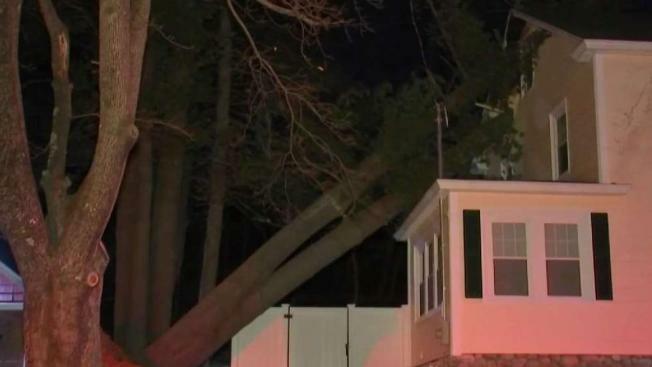 Across Massachusetts, emergency crews responded to calls of fallen trees and power lines in many communities including Milton where a tree fell on a car —trapping a nanny and a 4-year-old girl inside. "It actually collapsed the roof down," said Mitch Sumner, Milton's deputy fire chief. "We were able to cut the door off and extricate them out of the car." 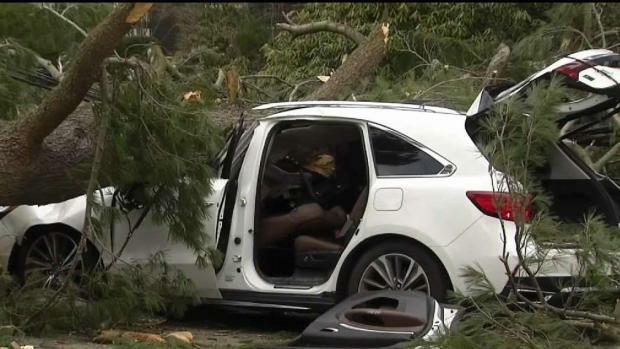 The Milton Fire Department says a 4-year-old girl and her nanny are lucky to be alive after high winds knocked a tree over, causing it to land on the car they were in. Officials say the tree landed just inches away from the front seat, trapping both inside. The child was getting picked up by her nanny at the Village School when the tree fell. "That could have been kids walking. That's scary," said one parent. Authorities said the driver was taken to Brigham and Women's Hospital for treatment of minor injuries. The child was taken to Boston Children's Hospital as a precaution. "She was a very lucky, lucky girl. To just have the injuries she had, neck, minor, so very lucky," Sumner said. In Natick, Massachusetts, a large piece of metal was dangling for hours off of St. Patrick’s Church. The dangerous scene over Route 135 played out for hours, forcing the road to be closed until it fell off. “It was very windy and there was a piece of copper...it finally came loose and came down,” said Pete Aufiero, who watched as the metal fell to the ground. Nobody was injured and no property was damaged. Police and fire departments around the region sent out warnings and road closures due to the high winds Monday. 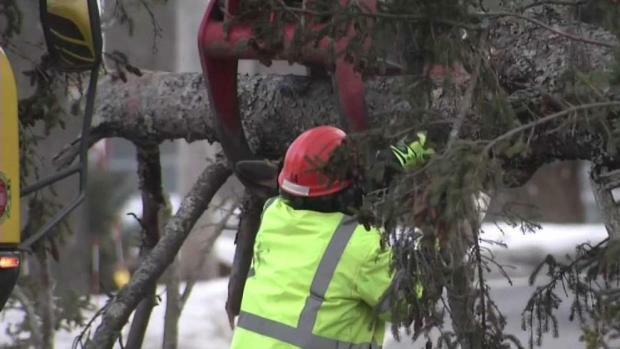 In Westford, Mass., a lot of trees made the city more vulnerable to damage and outages. Busy Route 40 was closed because of damage, and at one point about 40-percent of the town was without power, including most municipal offices. In Westford, Massachusetts, strong winds also brought down a tree on Depot Street. The driver was not hurt and able to safely escape. A number of roads around town had to be closed due to other downed trees and power lines. At one point, about 40 percent of Westford was without power. "It was horrible. I could feel like literally the house shaking," said Howard Liu of Westford. "Luckily, we have a generator, but I understand the winds are only getting worse." "We pay attention to the weather, so we were told 60 mph winds today. I think they're 55, so we were prepared," Westford Town Manager Jodi Ross said. Ross added that five schools in town were out of power and using generators, along with the highway department, town hall and the police department. Similar situations were reported in many other communities, including Newton, Needham, Natick, and Brookline. "It's not necessarily typical for this time of year, but it's a windstorm," said Stephanie Lanzillo of Chelmsford. Power issues caused some schools to dismiss early and briefly stopped Amtrak train traffic between Mystic and New Haven, Connecticut. At the highest peak in the Northeast, a wind gust of 144 mph has been recorded at New Hampshire's Mount Washington. The 6,288-foot Mount Washington is notorious for extreme weather. It long held the world record for fastest wind speed ever recorded at 231 mph. Officials said widespread power outages are possible, and travel could be difficult.